This weekend is was a super busy one for me. My family got together on Saturday to celebrate the graduation of niece number 4. Chaunsey-bear graduated in May and will be leaving in the fall to go to Graham-Webb in North Carolina. I’m super proud of her and was looking forward to celebrating with her because I missed the graduation and open house due to scheduling conflicts. I also had my monthly book club meeting on Saturday. This weekend I also started on my closet remodel. This is something that I knew I would get done by the end of the year, but had no intention of starting it this soon. 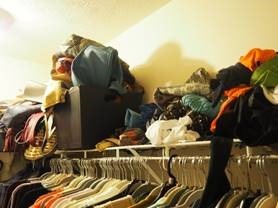 My husband and I talked about projects that we had coming up (him moving back into his office – can some join me with a big WOOHOO; and we wanted to get closets setup – he took the guestroom closet and I kept ours; and eventually we will start on the master bathroom upstairs flooring project). 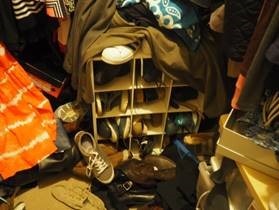 As I said I did not plan to begin my closet reno so soon because I’m in bill payoff mode. We completed our downstairs renovation right before last fall which included the kitchen, new flooring throughout the first floor, painting all of the rooms, new modeling, and custom window shades – I hope to give a tour and description of the transformation, but that will be a post that is several post long. Anyway, completing everything required me getting a new kitchen table and especially a dining room set (because I HATED the one we had – 6 months my eye.). I host Thanksgiving every year, so I needed to get my set before my family descended upon my home. 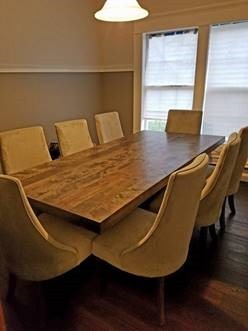 I was able to find the kitchen table quickly from Wayfair.com and got the chairs from World Market. The dining table took some searching…I knew what I wanted in my head I just had to find that in a store. I found it a week before Thanksgiving 1 WEEK before Thanksgiving and they just happened to have delivery two days before. The chairs were purchased from JossandMain.com. I love my table and chairs, but I paid for it a significant amount more than I had set aside…hence the payoff mode I’m in. But man do I love my dining room. The lighting wasn’t too great here…the table and chairs are gray and the wall color is gray and light silver. I’ll have better pictures when I show the complete renovation. 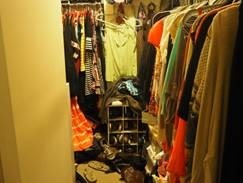 Ok, I’m getting off track…the closet. You know how sometimes (a lot of the times), your plans do not coincide with the plans the God has for you. Apparently my timeline for my closet reno was different than the one that God had and He let me know Wednesday morning when He told me to design my closet now; and then gave me a modification to my design while I was driving to pick up Babydoll that afternoon. I partially designed it and thought this would give me an idea of what kind of budget I needed and how much money I needed to save. Thursday morning, I had an urgency that could only be God-given to look at Menards website for the list of items I need to put my closet together. Since I hadn’t completely gotten the design set, I didn’t know where this was going. I found an online program that I used to get an idea of a design and the cost of the things I would need. The total was close to $800 and that didn’t include my REQUIRED shoe storage and the second section of drawers that God told me I had to add to my design. $800 was not disposable money that I have hanging around – payoff mode remember? I was an obedient child and took some time to look at Menards website after I completed my study that afternoon and low and behold I lot of the items I needed were clearance. I couldn’t wait to get to Menards before someone else found out and bought everything I needed. I got to the store after work and was trying to use the clearance items but they were all in cherry and I want my closet to be white (I already have three shoe bins that are white). So I kept walking around the area and started pricing another system by Dakota closets. I ended up purchasing everything I need for the long wall with the exception of four large drawers and the side poles for bottom hanging area because they didn’t have them in stock. I spent $130.07. Can I tell you that this wall was the most expensive one of the $800 design? Can anyone else attest to being obedient to God? He is the design for the major wall. The blue lines are the hanging poles – the top pole will hold my tops, jackets/blazers and pants and skirts will be on the bottom portions. I will have shelving over the top that will have baskets for my purses, that is represented by the thick gray line. I’ll have six drawers – two 5” deep drawers and four 10” deep drawers. I’m putting drawers in the closet because I don’t believe in dressers in the bedroom because they always manage to become cluttered; currently my bedside table are clutter central. I originally thought that wall was 96” long but found out it is actually 116” when I brought the top pole into the closet to make sure it was too long. I’ll be returning it and getting to adjustable rods that will need to connected. The extra inches has made it easier to find the poles for the bottom hanging areas because I thought I needed to find 24” poles (wasn’t happening either) but now I can get the 30”-48” adjustable poles for that area. 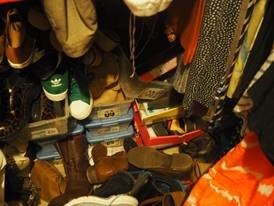 Here’s a picture of the closet in its current state – don’t judge. It has gotten to the point where I’ve given up on organization, plus my husband just abandoned items. He hasn’t come back to get the clothes so I’m going to presume that they are up for donation. 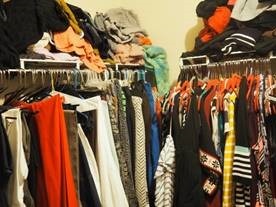 I’m going to be doing this in phases, because I can’t fathom taking everything out of the closet at one time. I’m already feeling some anxiety about the clothes that still in the master bath tub. The pressure was definitely on to complete it by the time I return to work tomorrow and that didn’t happen; so how much longer is it going to take me? I’ll keep you guys posted. Keep an eye out on my Instagram page, for some updates. Has anyone tackled a project like this in a weekend and succeeded? Send me some comments of encouragement, I can sure use them. Good morning my friend i miss you guys alot, I’m so glad you started your red oven it was the only way i feel some part of you guys life, So it sounds like you are really getting stuff done good for you just remember to not over stress your self things take time. love you guys think about you all the time. Happy to hear from you as well and we miss you much. This project got the best of me for about a day then I got out of my head and did what I know to do and it’s running a lot smoother.